The Utah Utes face the Arizona Wildcats on Saturday at Arizona Stadium. The opening line for this game has Utah as 4.5 point favorites and the over/under was set at 64. Utah was led in passing last game by Travis Wilson, who finished with 155 yards through the air. He went 12 for 25 on the game, good for a 48% completion percentage. Devontae Booker was the rushing leader for the Utes last game. He carried the ball 34 times for an average of 4 yards per carry and ended with 150 yards. Britain Covey was the team leader in receiving with a total of 69 yards and 5 receptions. He finished the game with an average of 14 yards per reception. As a team in that game Utah had 346 total yards on 70 plays. They gained 12 rushing first downs, 6 passing, and 1 by way of penalty for a total of 19 first downs on the game. The Utes rushed for 191 yards by way of 45 carries. 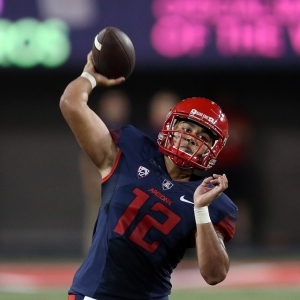 Arizona was led in passing last game by Anu Solomon, who finished with 352 yards through the air. He went 31 for 46 on the game, good for a 67% completion percentage. Jared Baker was the rushing leader for the Wildcats last game. He carried the ball 13 times for an average of 5 yards per carry and ended with 63 yards. Nate Phillips was the team leader in receiving with a total of 94 yards and 6 receptions. He finished the game with an average of 16 yards per reception. Arizona had 412 total yards on 79 plays. They gained 5 rushing first downs, 16 passing, and 3 by way of penalty for a total of 24 first downs on the game. The Wildcats rushed for 60 yards by way of 32 carries. Utah is averaging a total of 33.8 points per game on offense. In the air, they are attempting an average of 28.1 passes per game and completing 19.1 of them for a 68 percent completion percentage on the year. They are throwing for 203.3 yards per game through the air as well. The Utes are running for an average of 179.9 yards per game on 41.1 attempts for an average of 4.4 yards per carry. They are also running 69.2 plays per game and average 5.5 yards per play for an average of 383.2 yards per contest. The Utes manage 20.4 first downs per contest and they average a total of 40.9 penalty yards on 4.7 penalties. Utah allows 251.2 passing yards per game and 21.6 points per contest on defense. They give up 20.9 completions on 37.2 attempts per game for a completion percentage of 56.1. The Utes allow 114.3 rushing yards per game on 33.3 carries for a 3.4 average per play. Utah gives up 365.6 total yards per game including 5.2 yards per play. They force 2.6 turnovers per contest and get flagged for 5.4 penalties per game that total 51.6 yards as a unit. Arizona is accumulating 36.7 points per game on offense. In the air, they attempt an average of 36.6 passes per game and complete 22.2 of them for a 60.7 percent completion percentage. They throw for an average of 256.5 yards per game through the air as well. The Wildcats run for an average of 245.6 yards per game on 42.5 attempts for an average of 5.8 yards per carry this season. They also run 79.1 plays per game and average 6.3 yards per play for an average of 502.1 yards in each contest. The Wildcats are gaining 25.6 first downs per contest and they average 47.4 penalty yards on 5.5 penalties per game. Arizona allows an average of 276.3 passing yards and 34.6 points per contest. They give up 22.5 completions on 35.8 attempts for a completion percentage of 62.8 per game. The Wildcats allow 178.9 rushing yards per contest on 40.9 carries for a 4.4 average per rush. Arizona gives up 455.2 total yards per game including an average of 5.9 per play. They create an average of 0.9 turnovers per game and 7.2 penalties for 66.4 yards each game.